If you were to listen to most travel guides on Dubai, you would think the desert city materialised out of the air a decade ago. The city exploded in prosperity after the United Arab Emirates discovered oil in 1966, leading to a development boom that has resulted in the world’s tallest building, second biggest mall, most luxurious hotel, and more skyscrapers than any city besides New York and Hong Kong. Dubai was settled as a port city in the early 1800s, when it became a centre for fishing and pearling, and a crossroads of sea and land trade routes through Asia and the Middle East. That trading history can be seen in the souks, or markets native to the Middle East and North Africa. These are colourful places where traders of various nationalities hawk their wares, as your senses are attacked from every direction. Dubai has many souks, although some of the modern-day versions consist of rows of air-conditioned shops, all housed under a common roof. These souks are generally dedicated to certain items: spices, perfume, clothing. But the most extravagant is the Gold Souk, where people come from all over the world to get a deal. 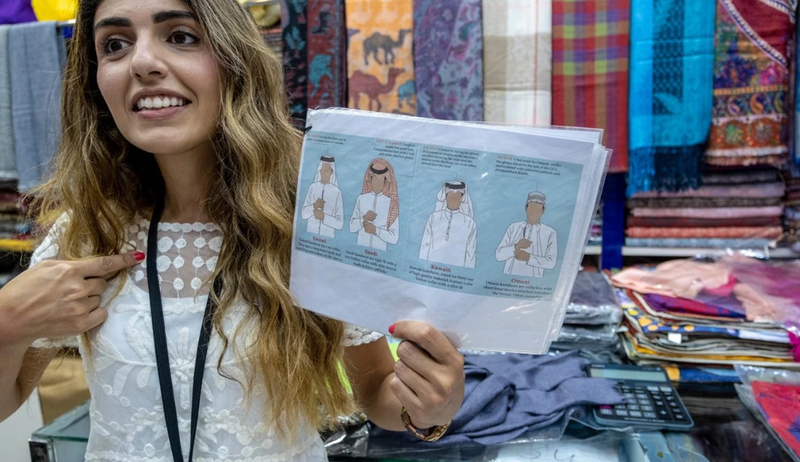 As Nada Badran, a Jordanian television presenter who has lived in Dubai for most of her life, told me these souks are the key to understanding Dubai. After a couple of days in the city, I felt like I was having a hard time finding local culture. So I met up with Badran, who hosts Wander With Nada on CNN Arabic. She agreed to take me through some of the better-known souks. Mega-projects like Palm Jumeirah, the world’s largest artificial island, and the Burj Khalifa, the tallest tower in the world, may be cool, but it was a dose of culture I was searching for. As Badran explained, Dubai’s culture does not reside in 1,000-year-old landmarks like those in Italy or Greece. The Emiratis were historically a nomadic people. A lot of the cultural riches found in the city come from its people, especially the immigrants, who make up nearly 94 per cent of the city’s 3.2 million population. Dubai has a long history as a port city and crossroads for trading routes that pass through the Middle East and Asia. It has since become a melting pot of Indians, Pakistanis, Filipinos and Arabs. 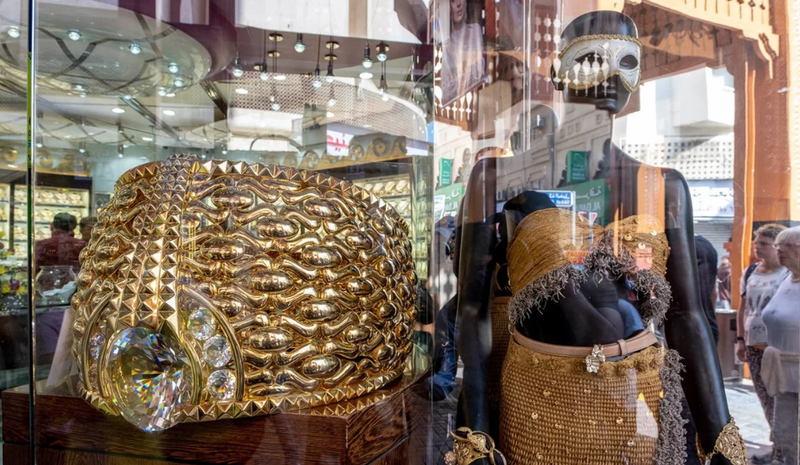 The souks draw everyone, and one of the most popular is the Gold Souk in Deira, one of the city's oldest neighbourhoods. The Gold Souk in Deira, Dubai. 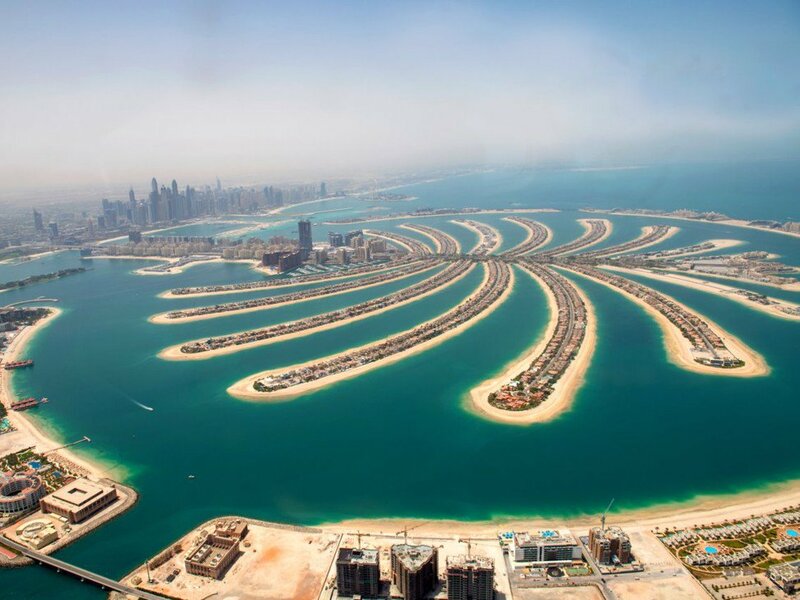 Dubai is often called the “city of gold” due to its meteoric rise to wealth in a single generation, but there could be another reason: as of 2014, 40 per cent and US$75 billion of the global gold trade flowed through Dubai. Much of it goes through the Gold Souk, the largest of the city's jewellery markets with over 380 retailers. The price of gold here is determined by three factors: the weight or carat of the gold, the design, and the labour needed to craft the piece, explains Badran. While the carat and weight prices are government-regulated, everything else is negotiable. Buying gold in Dubai is popular because labour is cheaper and, up until last year, there were no taxes. The new value-added tax has hit Dubai’s economy hard, and the government is considering doing away with it for tourists. The primary consumers of the precious metal are Indians and Emiratis, says Badran, hence the Gold Souk. You can see the influence of the customer base on the style of the jewellery on display. Some of the elaborate, heavier pieces cater to Indian customers, explains Badran. 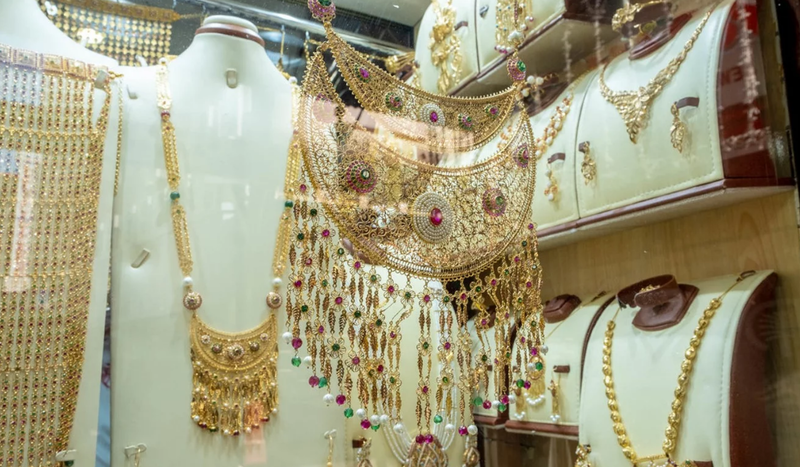 “It is traditional to buy gold in some cultures, for special occasions such as weddings and births, and they do not stop buying because of price changes,” Bhavin Sagar, the owner of Shantilal, a family-run business that is over 50 years old, told The National newspaper in Abu Dhabi, the capital city of the United Arab Emirates. For Emiratis, gold often functions as part of a dower or “bride price”, by which the husband and his family pay the bride and her family for the marriage. The dower is also an Indian custom, except in this case, the bride’s family is the giver. Wedding gold suites can get so elaborate and cost hundreds of thousands of dollars. The Gold Souk is also where the world's largest gold ring is on display. The 21-carat Najmat Taiba weighs 141 pounds and costs around US$3 million, and attracts a lot of visitors wanting selfies. 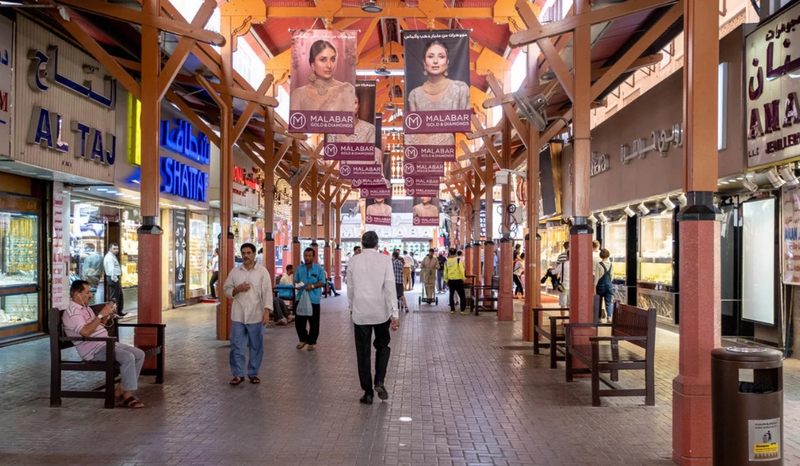 Because Dubai has a long reputation as a commercial and trading port dating back to 1800, the souks of Deira are where the “story of Dubai started”, Dr Hasan Al Naboodah, an Emirati historian, told The National. A few minutes from the Gold Souk is the Spice Souk. It’s full of tiny alleyways packed with shops stocked with every spice imaginable. It's a kind of sensory overload and, like many of the markets here, is a place where locals shop for everything from saffron and turmeric to sulphur powder and natural indigo. Most stores, Badran says, carry spices from Iran. 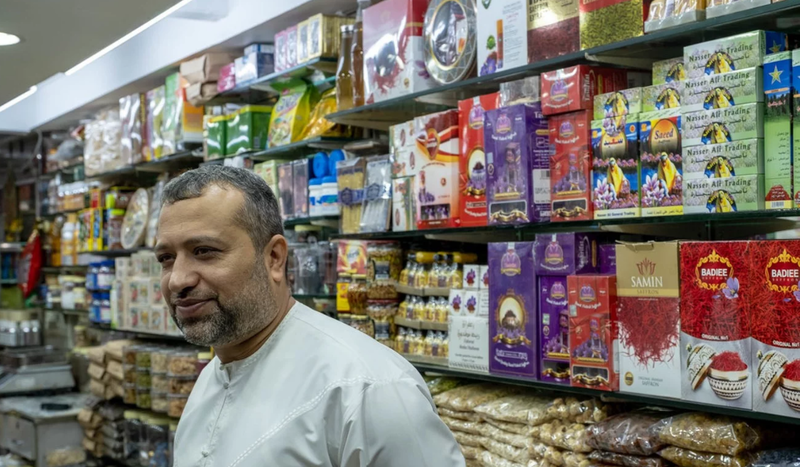 We are introduced to Saeed Neamatpour, an Iranian immigrant whose uncle owns the Nasser Ali spice shop. He provides us with a look at some of the shop's biggest sellers, including dates (of which there are more than 120 varieties) and oudh, a smoky resinous wood used by Emiratis as a perfume. Iran is famous for saffron, the most expensive spice in the world and often called “red gold”. The best stuff can sell for as much as US$20 a gram, but in Dubai it can be had for 15 dirhams, or about US$4, per gram. 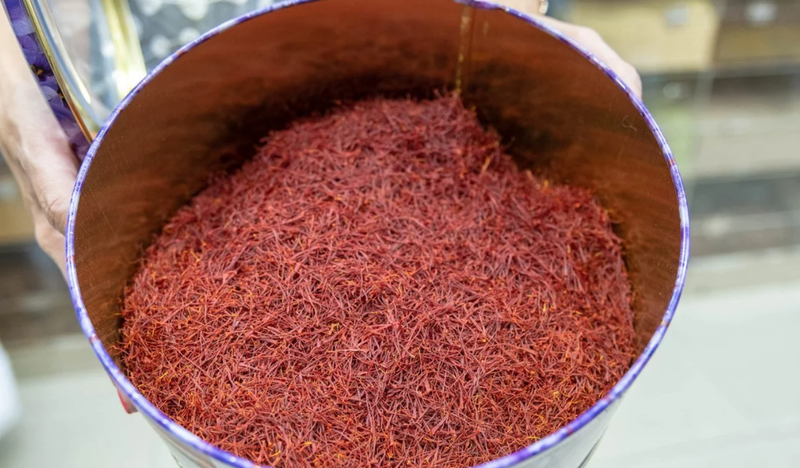 Iran produces a whopping 85 per cent of the world’s saffron. The colour is key to quality: high-grade saffron is red, while the lower-grade varieties have orange and yellow mixed in. The second-most expensive spice is vanilla, which comes from orchids that are exceptionally difficult to pollinate. Vanilla from Madagascar. 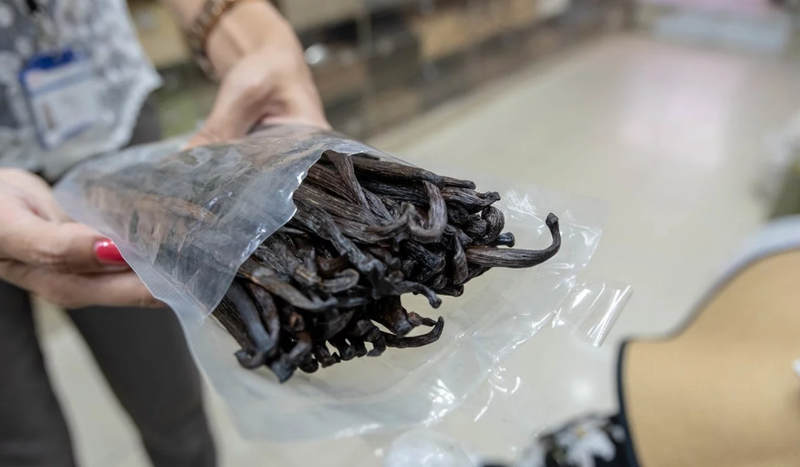 Vanilla is the second-most expensive spice to be found in Dubai’s spice market. Photo: Annie Zheng / Business Insider Vanilla from Madagascar. Vanilla is the second-most expensive spice to be found in Dubai’s spice market. 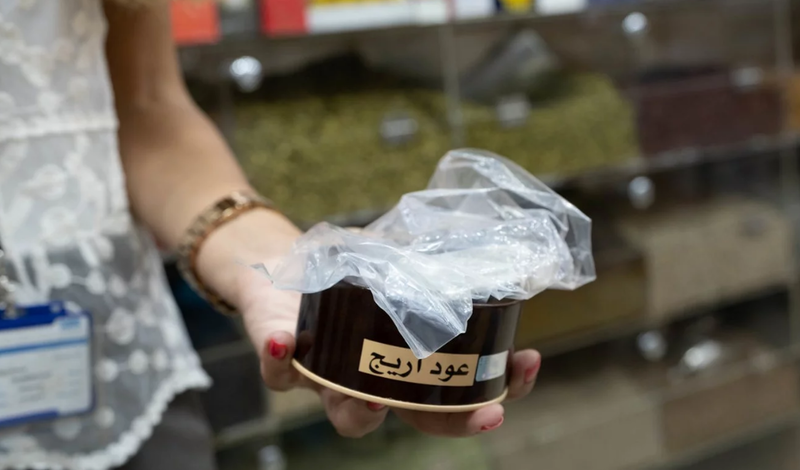 Also found in the market is oudh, an expensive resin used as a perfume ingredient since ancient times, and which remains popular in the Middle East. Oudh comes from the wood of the tropical Agar tree, when it has been infected with a certain mould. Only about 2 per cent of Agar trees become infected, so it is rare. Oudh is used in perfume and incense form in the Middle East. 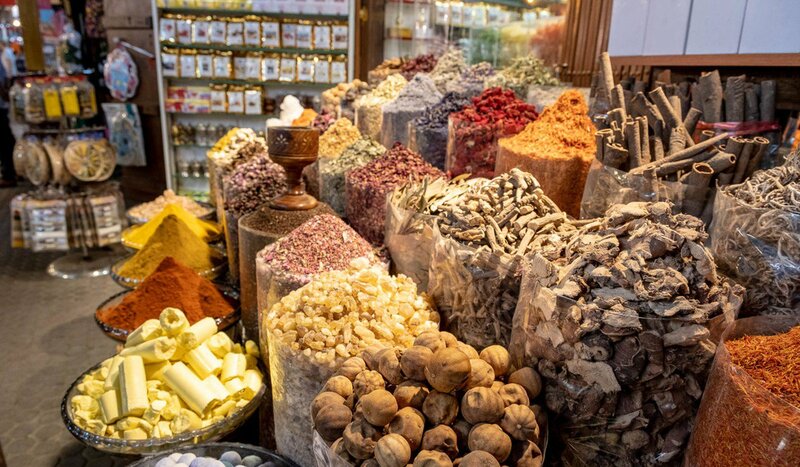 Photo: Harrison Jacobs / Business Insider Oudh is used in perfume and incense form in the Middle East. 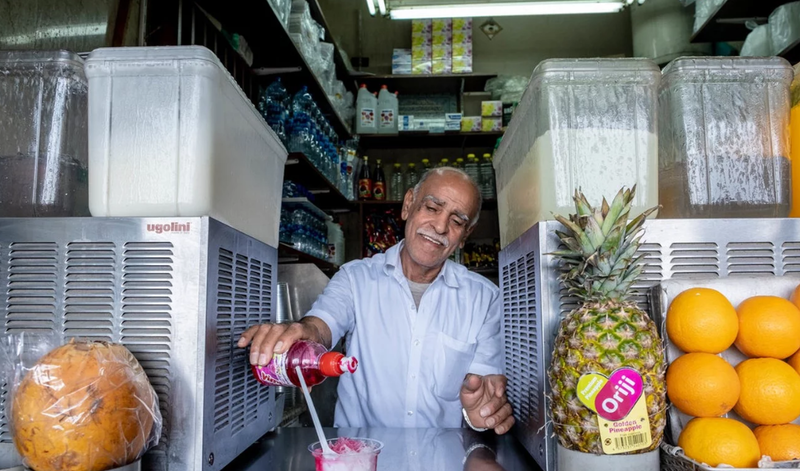 When you’re tired from all the walking around the Spice Souk, stop for faloodeh, a traditional Iranian dessert of vermicelli noodles with ice, rose-flavoured syrup and milk. To get to Dubai's oldest neighbourhood, Bastakiya (now known as al-Fahidi), we had to cross the Dubai Creek. The best, and most scenic way, is on an abra, a traditional Emirati water taxi. It costs 1 dirham for the ride. Riding an abra with the wind at your back is one of the most beautiful ways to see Dubai. You can ride all the way to downtown Dubai, but we were only heading across the water to Dubai’s oldest market, the Textile Souk. 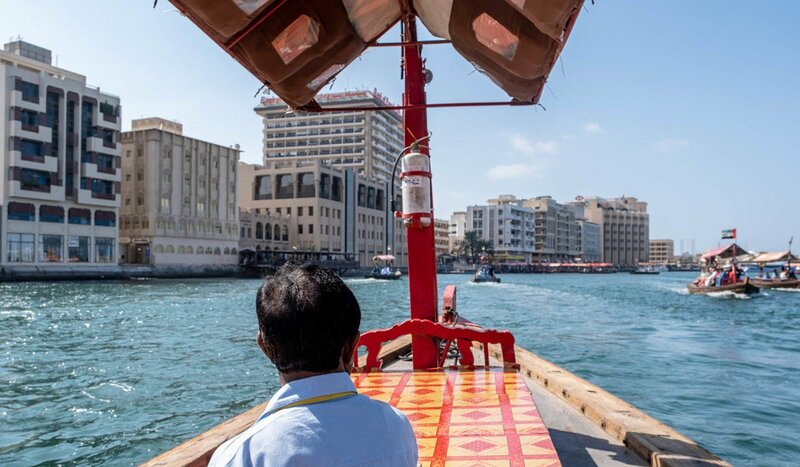 The abra, a tiny boat that ferries people across Dubai Creek, is a popular and low-cost means of transport. The Textile Souk is also known as the Old Souk. It is more touristy than the other markets, as its fabrics, souvenirs, scarves, sandals and clothes are sought after by visitors. One of the best things to do, however, is to pick out fabrics and patterns from a textile shop and have one of the tailoring shops in the market make you a bespoke garment. 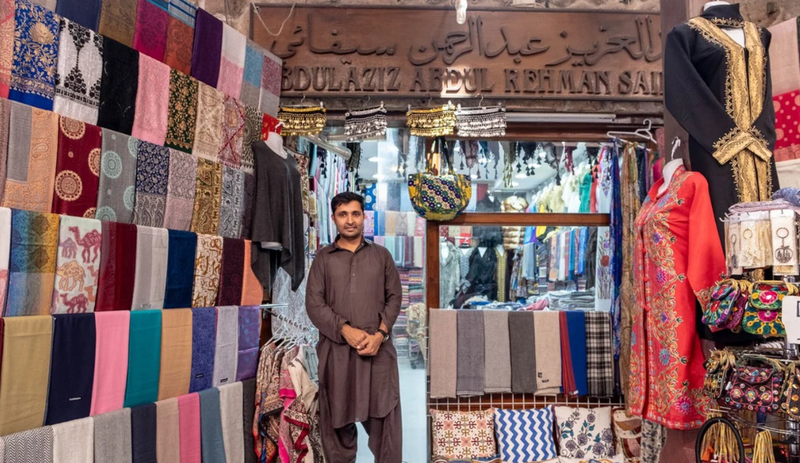 Badran introduces us to Abdul Rawof Khan, a textile merchant from Afghanistan. There are dozens of textile shops in Bastakiya, conveniently side by side with tailoring shops. As Badran explains, there are differences in the headdress (keffiah) and white robe (kandura) worn by men in the various Gulf countries. 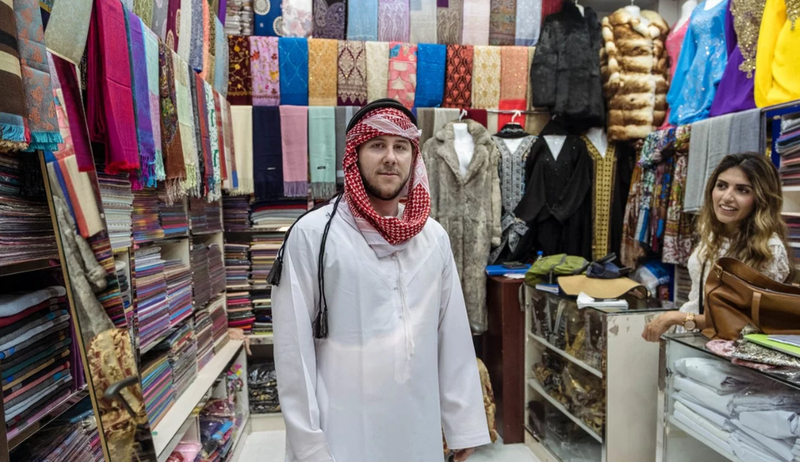 Khan convinces me to try on the traditional Emirati version: it is collarless and has a long tassel at the neck, which is known as a tarboosh. An Emirati-style kandura (white robe) and Keffian (headdress). My travel partner, Annie, meanwhile, tries on an Emirati abaya, the full-length black robe that women in the Middle East wear over their clothing, along with a scarf, or shayla, to cover the head. In contrast to the plain black abaya and niqab worn in some other Arab countries, Emiratis like to dress theirs with sequins, ribbons and embroidery. 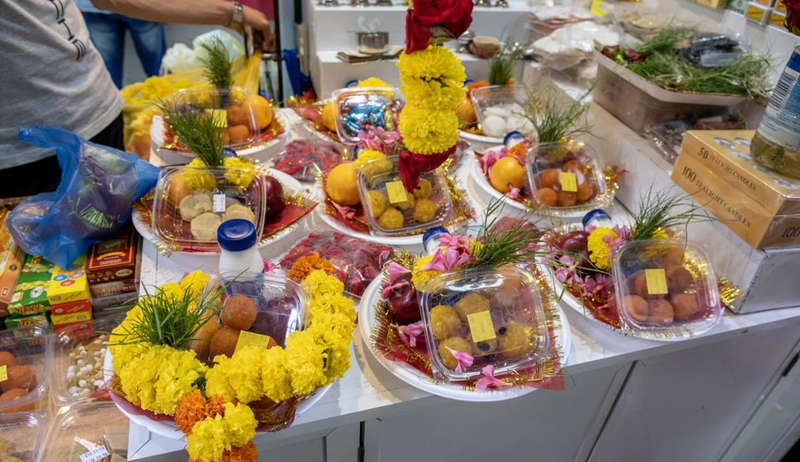 A short way from the Textile Souk is an Indian temple, which has long been a place of worship for Dubai's around 500,000 Hindu immigrants to worship. The space gets crowded on the big holidays. It's not very big, as you can see from the alleyway you take to get there and the ceremonial washing station in front. While it’s not exactly a souk, the alleyway to the temple is packed with small shops selling exactly the same thing: fruit and flower offerings to the temple deities.